One of my goals with this blog is to give you the chance to see pretty outdoor places around our state even if you can’t leave your office cube. 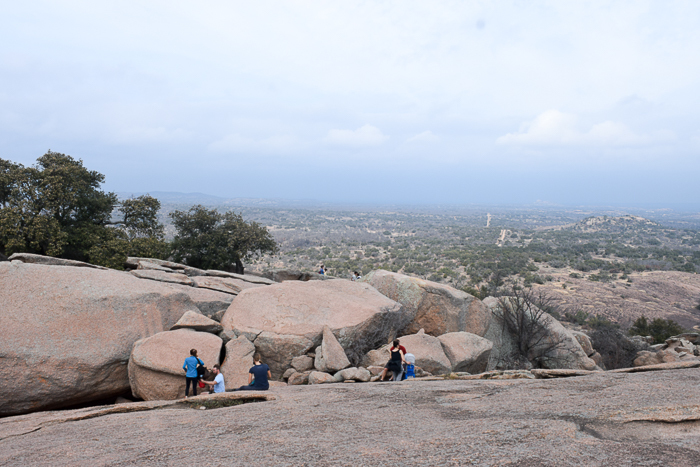 So today, a view from the top of Enchanted Rock! We went up there in the middle of January with some friends from Austin. It was risky as far as weather, but we threaded the needle between two freezes, and got a 70-degree day. 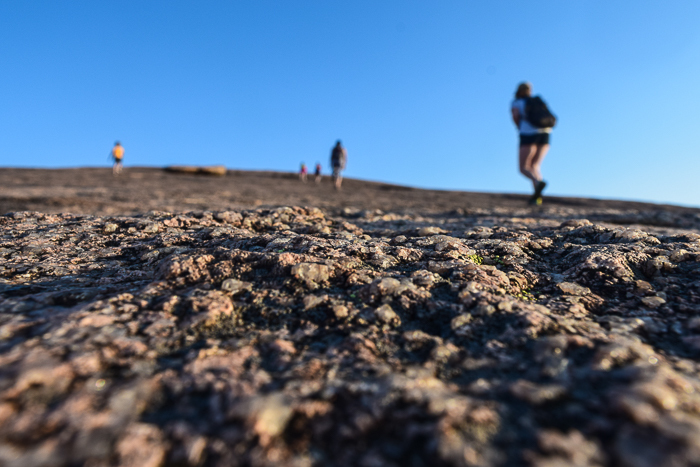 Enchanted Rock, for those of you who’ve never been, is nestled in the Texas Hill Country just north of Fredericksburg, two hours west of Austin. 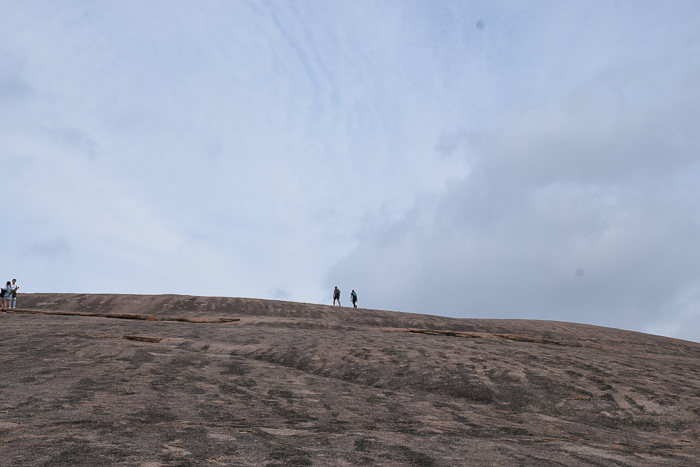 It’s in a region where pink granite juts out of the ground everywhere you look, with Enchanted Rock being the largest chunk–a huge beautiful dome surrounded by other smaller domes and rocks. Kind of like the monolith Uluru in Australia, but a big pink Texan version. It was insanely windy up at the top–50 mph! We all felt like we might blow away. 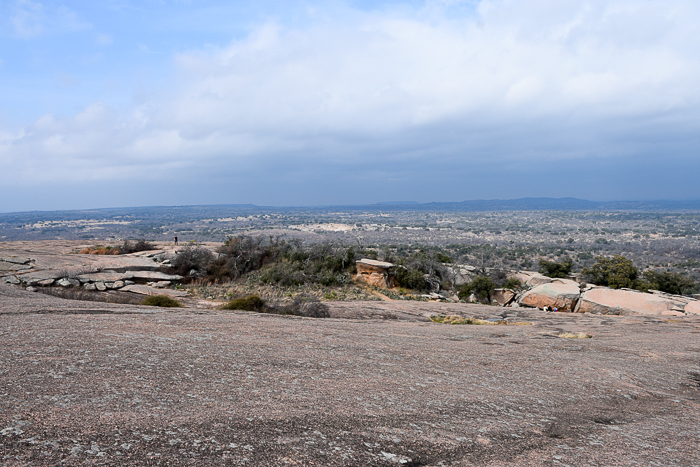 When you’re up on the top of Enchanted Rock, you are literally up with the birds. You’ll see them right at your level about a hundred feet away, soaring over the valley floor. None of them would stay in one place long enough for my pictures, but you get the idea. The climb to the top, for those of you who have never been, is about 20 minutes straight up once you reach the base of the rock. Of course, you can stop and take breaks–no shame in that–but man, it is a killer bun and thigh work out. A good thing to do in January when you’re trying to get back on the wagon! 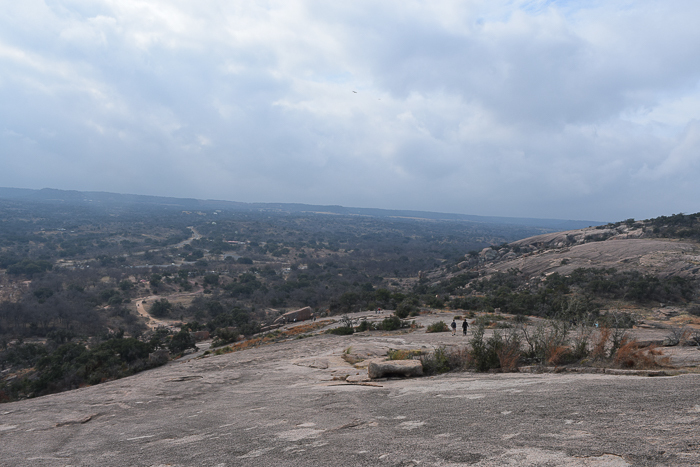 Love that pink Texas granite. When you get up to the top, there are caves you can go explore, or you can just sit and enjoy the view and give your legs a rest. On a less windy day, I like to bring a pair of binocs up there and scan the countryside, but we felt like we would blow off the cliff at any moment so sought the wind-break of some nearby rocks. 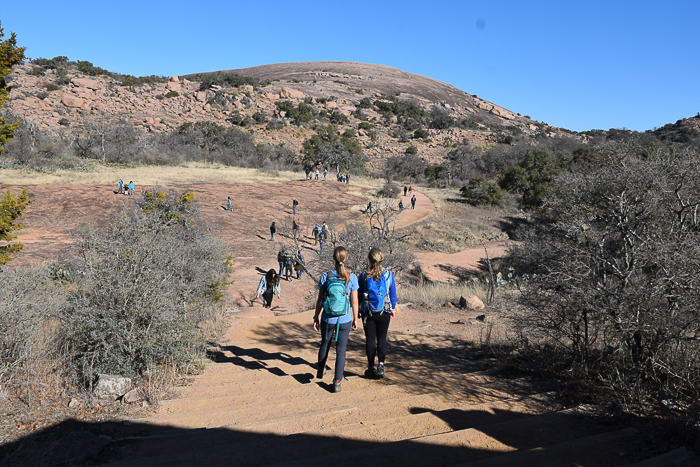 Enchanted Rock now has a food truck at the base of the mountain, so when you come back down you can get ice cream. It’s glorious! Much needed! Delicious! 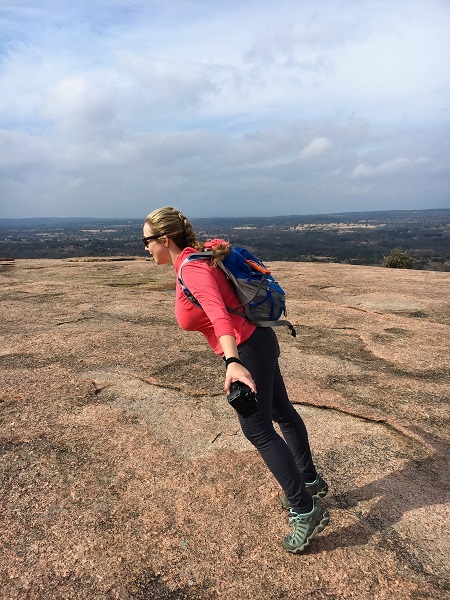 Enchanted Rock is one of my top 5 favorite state parks, and you’ll hear me talk a lot about it on this blog. So if you haven’t ever been, put it on your list. 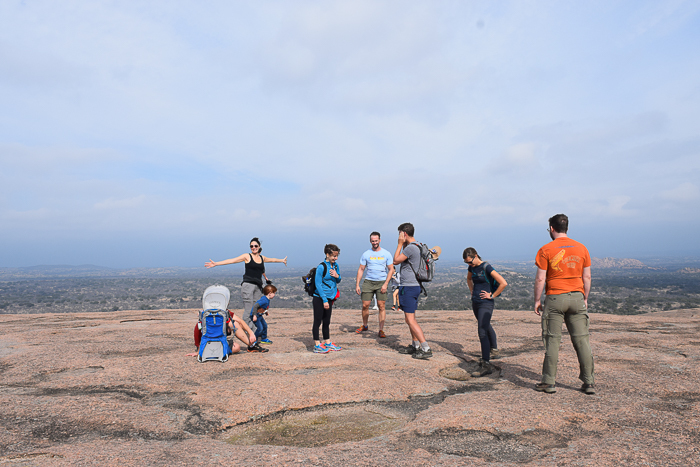 No Replies to "The View from the Top of Enchanted Rock"